Jay Dee suggested Musashi (武蔵国 / an old province that is now Tokyo, part of Kanagawa, and most of Saitama), and mushi (虫 / bugs/insects); Japan Australia suggested Murakami Haruki (村上 春樹 / best-selling author), mugi-cha (麦茶 / roasted barley tea), and Muji (無印良品 / a retail company); Paul suggested Murakami Ryu (村上 龍 / novelist, screenwriter, & film director), Murakami Takashi (村上 隆 / a modern artist), and Murasaki Shikibu (紫 式部 / author of The Tale of Genji); and Zooming Japan suggested mukade (centipede). Murasaki Shikibu (c. 978 – c. 1014 or 1025), or ‘Lady Murasaki’, was a Japanese novelist, poet and lady-in-waiting at the Imperial court during the Heian period (794 – 1185). Murasaki Shikibu was just a nickname and her real name is not known for sure, but it might have been Fujiwara Takako. During the Heian period women’s names were not recorded and it was common to go by a nickname associated with a male relative. Murasaki Shikibu’s most famous work is The Tale of Genji (源氏物語 / Genji Monogatari), written in the early years of the 11th century. The novel, today considered a classic, may have been written in chapter by chapter installments as Murasaki delivered the story to aristocratic women in the court. It was originally written in an archaic court language that was already unreadable a century after it was written, and it wasn’t until the 20th century that the novel was fully translated into modern Japanese. It was first partially published in English in 1882, and the first complete English translation was published in 1976. I have a copy of the book which I’m yet to read, partly because it’s so heavy one could use it as a doorstop! I think it would take me a long time to get through it, but I would enjoy the challenge, so it remains on my reading pile (perhaps for my retirement!!). Murasaki Shikibu managed to learn Chinese (the written language of the government at that time) during a period when most other women were not allowed to acquire such skills. In the 9th and 10th centuries Japanese gradually became a written language through the development of kana (abbreviations of Chinese characters). Kana became the written language of noblewomen, whilst men continued to write in Chinese. 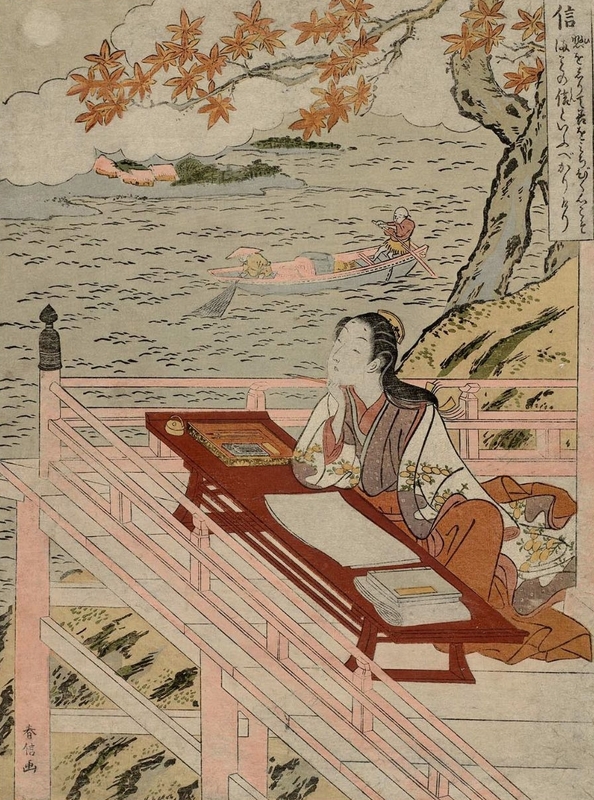 Murasaki was very fortunate to have had the chance to learn to write at all, as women were generally not thought to be capable of such things, but she would not have been the only woman in the imperial court with such skills. There would have been a number of court poets, and Murasaki would have been just one of them. 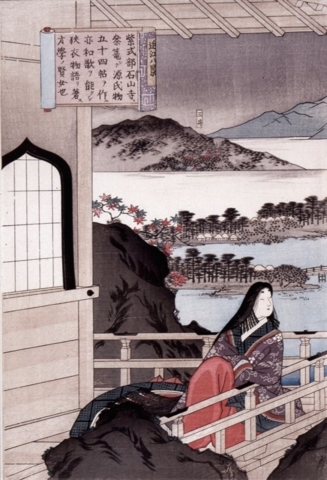 I find these images incredibly romantic, and like to think that if I had lived at that time in Japan I would have somehow found a way to be a writer like Murasaki, staring out at the Japanese landscape, searching for inspiration. There’s a lot I could say on the subject of Murasaki Shikibu and The Tale of Genji, but I’m no expert so I’m going to leave this post here and perhaps revisit the topic at a later date (certainly if I ever manage to read the whole novel!). 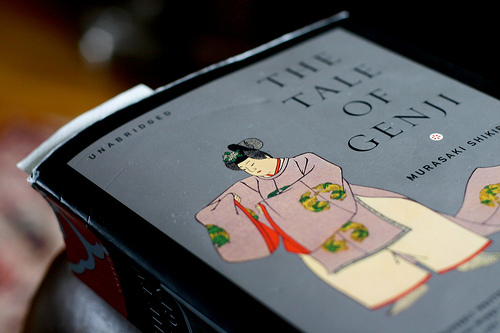 I’m curious though – have any of you, dear readers, ever attempted to read The Tale of Genji? Next week we’ll start with め (me), so please leave a comment below suggesting a topic for things beginning with め. Topics can be anything, as long as they are connected to Japan – food, places, people, characters, whatever you want to hear about! Just remember that the words you suggest must be Japanese words. I haven’t read it (yet). Have you seen the movie with Ikuta Toma? No, I haven’t seen that movie. I’ll have to add it to my list! Thanks for the ‘me’ suggestions! Glad I’m not the only one who hasn’t tackled it yet! I wonder how many Japanese people actually read Genji-monogatari. Well, I am one of the person who has never read1 Ha ha ha! No, never read it either. Like yourself, I’m a bit daunted by the length of it. I have been to Ishiyama-dera though (as seen in the woodblock prints in your post) and would recommend a visit if you are in Kyoto, especially if you can go when a tsukimi (moon viewing) event is on. For め　can I second Meiji Restoration as it is probably the most important historical event in Japan’s history. Glad it’s not just me who’s put off by the length! I should visit Ishiyama-dera next time I’m in Kyoto – thanks!